Join the discussion on our forums! Come discuss Lesser Diamond Spellstone over in our dedicated Lesser Diamond Spellstone discussion topic. Big Priest player, coming through! 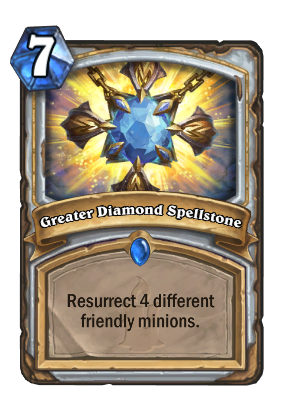 Sure, it may not work on turn 7, but Big Priest works on recycling minions multiple times. This is simply another cycle (or two) after all of the earlier shenanigans. You know, if the earlier shenanigans didn't already win one the game. My biggest question is will you be unable to play this unless you have 2/3/4 *different* minions dead at the threshold you're at? For example, you cannot even cast Eternal Servitude from your hand if you haven't had a friendly minion die yet. If I've had 3x Obsidian Destroyer die and nothing else, is this just a dead card in your hand or will it just serve as a more expensive Eternal Servitude? Part of me suspects it's the former, because it's more likely the discover mechanic that prevents the casting of servitude with no dead friendlies, but in some ways upgrading would almost be a bad thing if it works similarly. EDIT: Now I'm thinking it will not be castable if you don't have have X number of *different* dead friendlies because the Rogue spellstone says "Kill *up to* X random enemy minions." Seems like the majority of people think this can only be used in Big Priest (which I see happening the most), but what about an OTK Priest build? Priest would essentially run 4 minions, those being Barnes, Radiant Elemental, Phophet Velen, and Malygos or replacing Barnes with Y'Sharraj. The rest of the deck would be spells consisting of board clears and the rest of the combo pieces for the OTK. 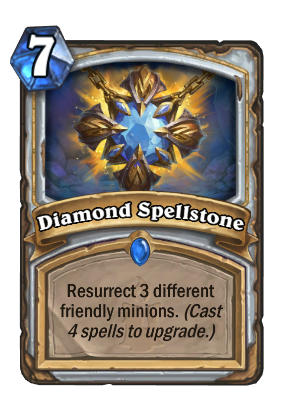 Essentially, you play the Spellstone and get Radiant Elemental, Velen, and Malygos all for 7 mana, and then can play two Mindblasts each for 20 damage and two Holy Smites each for 18 totalling a massive 76 damage in one turn for 9 mana. Might be useful with some of the new armor buffs classes are getting. Any thoughts on this or is this just too unrealistic and crazy to even attempt? I think your idea is stronger against control and much weaker against midrange/aggro. Have you only ever played big priest ? If you don't get barnes early which is more than 60 percent of the time, your first minion is at best turn 6 so no, you most generally don't have 3 minions dead by turn 7. I don't know why you're getting down votes. What you said is completely accurate. I've been playing big priest almost exclusively to combat the Keleseth Warlocks and Rogues that seem to dominate ladder and it's very few games I've done anything other than play board clears or spot removal by turn 7. Obviously, Barnes and Shadow Essence are what you're trying to get to "early" (well, early for BP standards) but really the goal is to just not die until you can just roll out massive roadblocks for opponent that they cannot deal with. I would say unless you're counting minions you steal and trade with Potion of Madness it's VERY rare to have more than 2 minions dead by turn 7 and I'd say it's even uncommon to have ANY minions die before turn 7. Resurrect Y'Shaarj, Rage Unbound, Obsidian Statue, The Lich King and Ysera... Good card, very balanced. P.S. Can I delete this message? I have not seen similar message by jsager99 before. Even the first version of this is useable in Big Priest. it might even be good to start with this in your hand despite the cost. Note that is says different. It will not summon multiple copies of the same minion. If two Prophet Velen died, is it different minions? Expensive but niche -> OP -> just f-off.